Videos are displayed as they were recorded, in groups of three or four presenters. Where possible, artists are presented individually and listed in the following sub-menu. 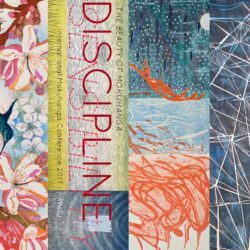 1) John Amoss – “Teaching Mokuhanga to Today’s University Students: Balancing Tradition and Technology.” Amoss is an Associate Professor of Printmaking at the University of North Georgia, United States, and owner of Tanuki Prints. He integrates student interest in Japanese culture and their desire to use software (Photoshop and Illustrator) while requiring them to demonstrate manual dexterity and craftsmanship and printing their own color charts. Page 31 of the catalog. 2) Hellory Maria Nella-Ponte – “Ligustro and Hokusai a Reincarnation in Italy?” Italian artist Nella-Ponte was a student of master Ligustro Giovanni Berio and presents her work in the context of his. Page 32 of the catalog. 3) Ruth Pelzer-Montada – “Mokuhanga Unlimited: The Context of Contemporary Print Media.” Pelzer-Montada is a an artist and lecturer in Contemporary Art and Visual Culture at Edinburgh College of Art, The University of Edinburgh. Her presentation explains the rationale for her anthology – “Print Matters: An anthology of critical writing on prints and printmaking since 1986.” Page 56 of the catalog. 4) Paul Binnie – “The Influence of the Past.” Trained in Japan, the Scotland-born Binnie has been a woodblock print artist for 25 years. His presentation shares the influences of the past on his contemporary work. Page 33 of the catalog. 1) Irena Keckes – Artist Presentation. Keckes has studied art in Zagreb and Tokyo and completed her PhD in Fine Arts from the University of Auckland. Her presentation focuses on displacement/migration and printmaking and how environments inform the conceptual engagement of her art. Page 43 of the catalog. 2) Jennifer Mack-Watkins – “Promoting and Passing on the Tradition of Mokuhanga.” Mack-Watkins has an MFA in Printmaking from Pratt Institute and participated in the artist-in-residence program at the Mokuhanga Innovation Laboratory. 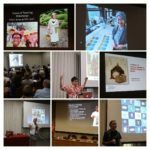 Her presentation provides a format for artists or groups to plan a mokuhanga workshop for larger audiences. Page 50 of the catalog. 3) Paola Gonzalez – “The Adoption of Mokuhanga in Schools and Communities: A research in progress about the teaching process of non-toxic techniques of xylography in Chile.” Gonzalez is a teacher of visual arts and her presentation focuses on the use of non-toxic techniues in Chile’s xylography courses. www.xilografia.cl. Page 38 of the catalog. 4) Hellory Maria Nella-Ponte – Italian artist Nella-Ponte was a student of master Ligustro Giovanni Berio and discusses his use of the old, deluxe techniques in the context of surimono. Page 58 of the catalog. 1) Karen Kunc: Picture This: Illusion and Action in Mokuhanga & Manga. Kunc is the Cather Professor of Arts at the University of Nebraska Lincoln. Kunc addresses her lifelong in influences of ukiyo-e prints and adaptations of mokuhanga techniques in her woodcut prints. In particular are the effects of spatial illusion and depth from bokashi gradation blends as a “visual hook,” which organizes the unmappable spaces and chaotic actions within abstractions. Page 46 of Program. 2) Keiko Hara & Akira Takemoto: Mokuhanga as a Vehicle for Internatioal Exchange. Professors Hara and Takemoto are affiliated with Whitman College, where they address educational practices that cultivate traditional and contemporary mokuhanga techniques that can include information about international exchanges and residencies that expand horizons and inspire a younger generation of artists. While originating in Japan, mokuhanga can be seen as a vehicle for international exchange. Page 41 of catalog. 3) Florence Neal: Marketplace Issues Explored by an Artist, Curator & Non-Profit Gallerist. Neal is a printmaker, installation artist and sculptor who expands the traditional means of printmaking into the realm of public art and installations. Page 56 of Catalog. 4) Kari Laitinen: Scenery to Woodcut Art in Finland: History and Movement since the 1980s. Laitinen is a printmaker who addresses the development of wood cuts in modern Finnish art. Page 47 of the catalog. 1) Karen Helga Maurstig: Floating with “20 Coastal Stations”. Maurstig is an artist whose presentation focuses on “20 Coastal Stations” — a project dedicated to mokuhanga and craftsmanship in August 2015, when six artists from Japan, Sweden, Finland and Norway travelled along the Coast of Norway for 18 days. Page 51 of catalog. 2) Lucy Schofield (via Ralph Kiggell): The Moon and the Sledgehammer. Schofield is an artist drawn to isolated places, spaces that are at once remote or time extending. She is interested in exploring how spaces impact on our sense of dislocation or belonging. Her practice explores language, impermanence, vulnerability and belonging in terms of the cultural narratives we inhabit. She is interested in the conversation between the temporary and the permanent, the familiar and unfamiliar, the awkward and the intimate. Page 59 of catalog. 3) Elettra Gorni: The Mokuhanga Technique at the Service of Visual Narration: a sample of a set of ten print Shiikia Shashinkyo. Gorni is a mokuhanga artist who shows that the mokuhanga technique provided Hokusai with specific resources (e.g. the bokashi gradation) to be narratively effective. The technical and expressive support coming from mokuhanga, mixed with iconographic motifs typical of the traditional eastern spatial representation contributes to the building of a visual and narrative syntax specific to Japanese woodblock prints. Page 39 of catalog. 1) Melissa Schulenberg. “Educational Mokuhanga Practice: From Student to Teacher to Student”. Schulenberg is an associate professor of art at St. Lawrence University in Canton, N.Y., who has had residencies in Japan, Ireland and the U.S. Her presentation discusses the challenges of teaching mokuhanga to college students, most of whom are not art majors. Page 60 of catalog. 2) Paul Furneaux. “Passing Light and Shadow: Printing for a Fourth Dimension.” Furneaux of Edinburgh, Scotland, graduated from a master’s course in mokuhanga from Tama Art University in Japan after studying painting at Edinburgh College of Art. His presentation introduces his explorations with mokuhanga — large-scale prints stretched over aluminum panels and his three-dimensional sculptural prints. Page 36 of catalog. 3) Jacqueline Gribbin. “Land and Sea: Creating Mokuhanga from the Environment”. Gribbin is an independent artist based near Darwin, Australia, who was trained in England and Japan, where she was an Artist-in-Residence at the MI-LAB in 2012. Her presentation shares three projects in Northern Territory, Australia. Page 40 of catalog. 4) Sau-mui Yung. “A Century of Hong Kong Woodblock Printing, from 1930 to the Present”. Sau-mui Yung is Program Director of the Hong Kong Open Printshop. Her education in printmaking took place in that city and at the Universities of Alabama and New Mexico. Her presentation investigates the development of woodblock printmaking in Hong Kong with images from that city’s Heritage Museum. Page 64 of catalog. This video compiles three 30 minute presentations of papers; depleted battery prevented the recording of the fourth presentation by Hiroki Morinoue. 1) Katsutoshi Yuasa: Mokuhangaholic. This MFA from London’s Royal College of Art and member of IMC’s International Boad has had residencies in Amsterdam and Paris and has worked with mokuhanga for 17 years. His presentation addresses how retired men in Japan have turned a hobbyist’s interest in mokuhanga into an obsession. Page 62 of program. 2) Mike Lyon: Artist Presentation. Lyon is a full-time artist in Kansas City, Missouri, who has been interested in Japanese art since childhood. He has focused on post digital printmaking and graphics by combining traditional materials and techniques with automation and digital technology. Page 49 of program. 3) Tuula Moilanen: Visualization of Time and Eternity in Japanese Woodblock Prints from the Late 8th Century to the Present Day. Moilanen is the founder of the Finnish Woodcut Artist Society, who lived in Kyoto for over 20 years. She became a Doctor of Arts at Helsinki’s Aalto University in 2013. Her presentation charts Japanese symbols of time and eternity and investigates how they are expressed in woodblock prints and printing processes. Page 52 of program.